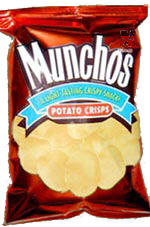 Munchos Potato Chips from Frito Lay. Nice, full and fluffy. At almost a full ounce a bag, they mak the perfect after sandwich chip, or in between meal snack. Munchos are one of our most requested chips.